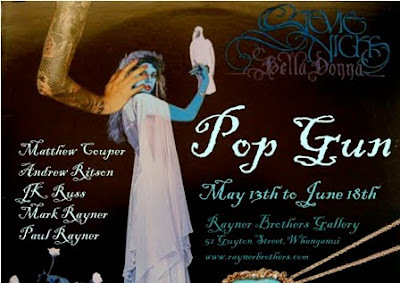 There's been a bit of a lapse in posting due to traveling around New Zeland and limited access to internet connections but here's the next invitation to "Pop Gun" at the Rayner Brothers Gallery at 52 Guyton Street, Whanganui, New Zealand. The exhibition opens on Friday the 13th of May, 2011 and features new art works related to pop music by Andrew Ritson, JK Russ, Mark and Paul Rayner and me. I'll be adding my works to my website by the opening of the exhibition and will be previewing a couple of works on my Artist facebook page.